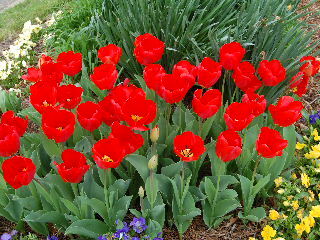 Nothing adds more brilliant color to your garden in the early spring months of the year than flowering bulbs. From the earliest appearing little crocuses, that stick their heads up so early they are sometimes seen blooming through the snow, to the later and larger tulips, daffodils, and hyacinth, bulbs lead the way into the gardening season. One of Nature’s great lessons of course is that we reap what we sow—so in order to enjoy the beauty of spring, we must properly prepare during the chill of the preceding fall. We want to plant our spring flowering bulbs as the weather cools, usually about 4 to 6 weeks before actual freezing of the soil begins. This way, the newly planted bulbs have time to form healthy roots and acclimate to the oncoming cold of winter. Proper preparation is vital. A loose, well-drained soil with lots of organic matter is necessary (add peat moss or compost if soil is too wet or tight). Bulbs prefer a sunny location and their colors look more brilliant to the eye with bright sunlight bouncing off the blooms. Bulbs also make a more dramatic showing when planted in groupings (clusters of the same or mixed colors and varieties planted together rather than planted singly). IMPORTANT TIP: Visualize how you want your spring flowering bulbs to appear as a part of your overall landscape by laying out the bulbs on top of the ground before you begin to dig or plant. In this way, you will be able to adjust the scale of the flowering area to fit into the scene of evergreens, trees, and other plants that are a part of your garden. Also, by laying out your bulbs before planting, you can visualize and adjust varieties according to height—shorter stemmed tulips or hyacinths in front with longer stemmed daffodils in back. After you’re satisfied with the layout, use a shovel or hoe to mark the boundaries of your bulb planting area, then move the bulbs aside (still in the same pattern) onto a nearby area, and use your tiller or a garden spade to dig up the whole planting bed. Scatter some super-phosphate onto the bed and dig or till it into the soil. See our article: Numbers On The Fertilizer Bag--What Do They Mean? for more information on "super phosphate." When your planting bed is loosely and deeply (8 to10 inches) tilled, lay all the bulbs back onto the surface and then plant them one at a time at a depth of about 2 to 3 times the diameter of the bulb. 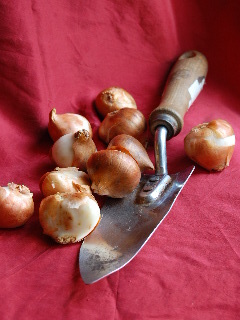 To me, the best tool for planting bulbs is a garden trowel—I find it easy to plunge the tool into the soft soil, tilt it slightly, and insert the bulb as I remove the trowel from the soil. This works better for me than those rounded bulb planting tools which always seem to be clogged full of soil. Plant the bulbs with the roots down and the pointed tip up. I know it sounds elementary to tell you this, but with some kinds of bulbs it can be difficult to distinguish top from bottom. If this is the case, don’t worry—just plant the bulb on what appears to be its side, and it will send the right stuff in the right direction! After planting, water the area and cover the entire surface of your bulb bed with a good layer (2 to 3 inches) of mulch—I like the shredded hardwood bark mulch. Next step—wait until early spring! There now—that was easy, and don’t those beautiful blooms look great? As the flowers fade, cut off the bloom stalks but don’t remove the green foliage of the bulb tops until it starts to brown. The plants need to make food and store it back into the bulb before going dormant. As the spring flowering bulbs start to fade, begin planting summer flowering varieties like the gladiolas. The cycle goes on and Nature continues to share seasonal gifts with you.